We are pleased to announce the addition of the Microbial Identification Test by MALDI-TOF MS to the menu of NRL's Microbiology Laboratory at ICAD, Abu Dhabi. The MALDI-TOF MS (matrix assisted laser desorption ionization-time of flight mass spectrometry) technology represents a revolution in routine pathogen identification as it significantly reduces the turnaround time of bacterial identification by at least 12-24 hours. This is achieved by replacing selected steps from the conventional microbial identification process, such as confirming the genotype samples for isolated cultures. As a result of its accuracy and speed, the test helps improve patient outcomes and quality of care by speeding diagnosis. Maintain a subculture at the submitting laboratory. The MALDI-TOF MS method uses a laser to ionize the sample consisting of proteins and polymers, where the analyte is embedded in a crystal aromatic matrix. The presence of the matrix causes the large molecules to ionize, instead of decompose or fragment, when absorbing the laser energy. 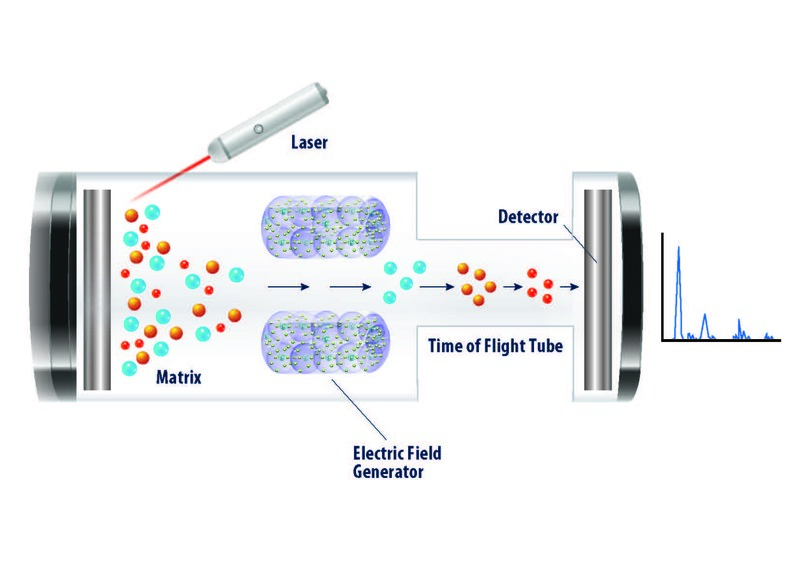 As a result, the analyte ionizes into a gas phase and a “cloud” of proteins is released into a flight-tube in the mass spectrometer. The proteins are accelerated by an electric charge, and after passing through the tube, their “Time of Flight” is recorded. The proteins are then detected with a sensor that creates a spectrum which represents the protein makeup of each sample. Finally, the spectrum is compared to a known database of proteins, and according to the match, the microbial identification is completed. For more information about the technology and clinical applications, please see an article by NRL's Director of Technical Operations, Albarah El-khani, published in Arab Health magazine.